He says he won’t compromise his Christian beliefs. The bus’ front display says “HAPPY PRIDE” and a banner on the side says “Ride with Pride” with information about Calgary’s Pride week. 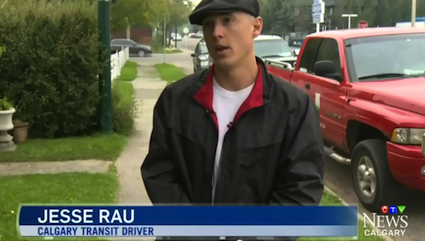 Now meet Jesse Rau, a Calgary transit driver who would rather lose his job than compromise his values by driving a rainbow bus. However: “If I’m asked to compromise in such a big way for what I believe to be right, yes of course I have to lose my job, there’s nothing else that I can do,” Rau told CTV Calgary. The city’s first official Pride week was proclaimed by the mayor in 1991 but he faced so much backlash that he took it back. This year, in addition to the Pride bus, Calgary has rolled out a rainbow road. Calgary’s Pride celebrations kick off on August 28 and the bus will remain in service through until the day of the parade on Sept. 6. This was a historical moment. June 16, 2014 Artur Pawlowski Comments Off on This was a historical moment.